Central equilibrium. This is the Chinese word I know it as—Zhong Ding. I assume readers are familiar with it. I came to understand that central equilibrium is more than alignment. Alignment has a linear quality that we can become aware of in our bodies. It is two-dimensional, a line between two points. Equilibrium, which we can also become aware of, is orientation in relation to our environment. It is multi-dimensional. It is how we balance ourselves in response to the pressures from outside, of which there are many. Almost every move we make is a response to some external force in our environment. The environment could be the physical environment near us or it could be a more abstract environment — distant and foreign. Part of the release, and the relief, of letting go of things that are not essential to our well-being, which is a tai chi practice, is distinguishing between what it’s necessary to be concerned about and what is not. We confront the overwhelming pressure from outside with great risk. We cannot defeat it, but we can relax and let it be. We don’t have to be concerned that we must respond. Yin instead of yang. Let yang take care of itself. Focus attention on yin. So the act, as simple as it may be, of letting something go—tension, stress, anything at all—is emancipating. Our bodies respond accordingly and become satisfied, contented, rested. You could call what I’m attempting to navigate in this blog a philosophical trek into the fascinating world of tai chi. Through personal insights into my particular experience learning, doing, questioning the art of tai chi and qigong movement. It’s about an exercise in language, as well as an exercise in practice. I exercise with the body and exercise the mind to try and articulate what is going on in both upon the playing field of tai chi and try to figure out where it’s all heading. Tai chi and qigong are moods–somewhat of an ephemeral notion to a novice perhaps, yet real to a long-term practitioner. If you skip practice for a certain amount of time, you begin to miss it. Your body might even crave it and you won’t feel content until you practice. Both tai chi and qigong place you in a feeling of being more fully present in a moment–a mindfulness moment. Something about that feeds the spirit. When you do the moves that make up these systems of exercise, you’re tapping into the flow of energy prevalent in the universe. Imagine yourself dipping your toe into a river … the vast energy of life. How long you can go without a feeling of being swept up by the rush of the current, or the wind lifting your spirit? In taiji (tai chi) practice, I’ve heard people say: “change the mind, change the body” which has a catchy sound. Sometimes, I’ve heard the opposite: “change the body, change the mind.” I don’t think it’s one or the other, rather both have relevance at different times. Sometimes it’s one and sometimes it’s the other. Knowing when may help in your taiji practice. You can approach taiji practice by changing your mind first or by changing your body first. What does change mean? In taiji movement it means changing from one state of being to another. From stillness to movement, movement to stillness, or being quite when moving and being active when still (think about that for a while). It can be changing from one direction to another, from a posture to a transition to stepping forward or backward. Or it can be changing from one stance to another. Many types of changes are available to the practitioner. Movement and change make up the core of taiji. The beginner usually, by force of habit, emphasizes physical aspects of movement. Specifically, we move by flexing muscle. Mental focus is always a key part, of course, but mostly not the main intent. The mind is only a tool for directing muscle movement. It may not be so obvious at first, but with practice and patience mind intention becomes the main focus of your taiji activity. Most of the time when I shift my mind’s eye to move in a manner specific to taiji—a sequence or a pattern—the body responds easily. This relates to the progression of mind-energy-body, or “yi-qi-sing li,” as I’ve heard my teacher, George Xu, say. In yi-qi-li progression, mind creates intention, energy flows, and the body follows. In more practical terms, you focus your attention on a locus in the body and the qi flows there on its own, then the body moves effortlessly with intention thus set. This may not be the case in a beginner’s taiji practice. We may have tension in our bodies that we’re not aware we have. We unconsciously clench and hold back, which hinders free-flowing movement. Taiji practice is partly a process of discovering these tight spots and changing that state of being. Move deliberately, without deliberation; with continuity, not hesitation; with smooth, rounded movement, not sharp, sudden changes. Achieving these is the activity of learning taiji. We often are not sure of ourselves at first, so taiji is a practice in learning to feel familiar and comfortable with the movements. At first, it’s often rote memorization. Your muscles, bones, joints, ligaments and tendons are introduced to new movements. Later, maybe not very long, you discover that your body remembers differently from how your brain remembers. I wouldn’t call it “muscle memory” exactly. You might even relate it to the saying that “you never forget how to ride a bike.” In the case with taiji, your body is the bike and it retains the memory of taiji movement. It’s cumulative over time. At more-seasoned levels, I would say that it’s a change in feelings and awareness. Obvious, right? Maybe. Maybe not. At first, the effort to merely memorize moves and sequences makes eloquent movement elusive. Free flowing, graceful movement imbued with intention is the supreme ultimate expression of movement. Only through regular, consistent practice will you achieve it. More for some, less for others, but required of all. When I feel good physically, I usually also feel good mentally. When I feel bad mentally, my physical body is fatigued—weary, shut down. Opening the chest, for example, takes immense effort because my emotions are squeezing the ribs and fascia shut. When this happens I really have to try hard to open the body up, but when I do my mind opens with it. Changing the mind is very much an exercise in sharpening your awareness. We all developed habits of movement through life. Those habits become invisible to us. We have “internalized” that habit. Ironically, in taiji we seek to internalize new movement, which produces great benefits. New movement has healing power. It generates healing energy, or qi, that flows though the body and even beyond it like a cleansing force, like running water through a cup or vessel to wash out the dirt. Next time you practice taiji you might like to try these concepts: change the body, change the mind, or change the mind, change the body. Editorial Specialist, Paul Tim Richard, MA, studies, teaches and blogs about fundamental principles of taijiquan and qigong as he understands them. He also produces and edits instructional videos of master practitioners. Tai chi doesn’t have to be something you schedule to do. With a little knowledge you can practice a simple technique anywhere, anytime. Here’s one idea. One way to begin tai chi is simply by standing. 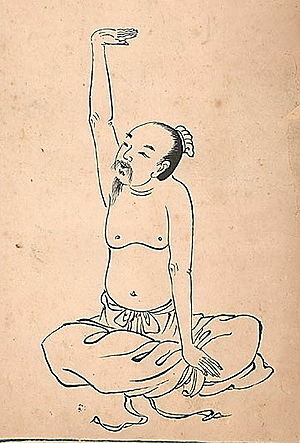 For example, Wuji is the first posture in a tai chi form. You return to Wuji when you finish form. It basically means to stand quietly but alive and agile. It’s sometimes called “standing like a mountain”; silent, expansive and powerful. “Empty” is another term used to describe the state of being in Wuji. Quiet, without thought, without tension, even without mind. The Classics say that Taiji was born out of Wuji and from Taiji came Yin-Yang, or the separation and movement of things in the world. So when you stand in Wuji then move, you are expressing a universal principle of Taiji, the supreme ultimate expression of movement. Breath should be natural, even and full, but not strained. Place your attention on your feet. Feel the surface of whatever you are standing on with the soles of your feet. Feel the muscles. Feel the weight. Feel warmth or coolness. Shift your weight slightly to one side then the other. Feel how your body as a whole responds and adjusts to the shifting. Visualize something like water or a breeze flowing into the ground through the point behind the ball of the foot. See how far you can project the flow into the earth. Now, visualize the flow rising from the earth through that point all the way to the top of your head and back down. Feel how the rising force causes your body to rise with it. That’s it, that’s all you have to do. Just standing in Wuji and visualizing a flow is good practice any time you like. Eight pieces of brocade (ba duan jin) is an ancient Qigong that incorporates powerstretching, spiraling, open/close, up/down, left/right and energetic realignment. It seems to be a physical exercise at first, but it is more. It is a medical qigong, since each move positively affects an organ, such as liver, heart, lungs, stomach, kidneys, and central nervous system. It is an energy qigong because as you learn to do the postures through practice you relax the muscles and allow energy to travel in previously unused channels. It is a martial qigong because it incorporates many, if not most, of the essential configurations of tai chi internal movements. Eight pieces of brocade is ultimately a path of becoming aware of qi (energy) and learning to move it, and directing it at will. This healing aspect of this qigong is its true power.